After a blizzard of November theater on Maui, “Elf The Musical” stands alone on Thanksgiving weekend. 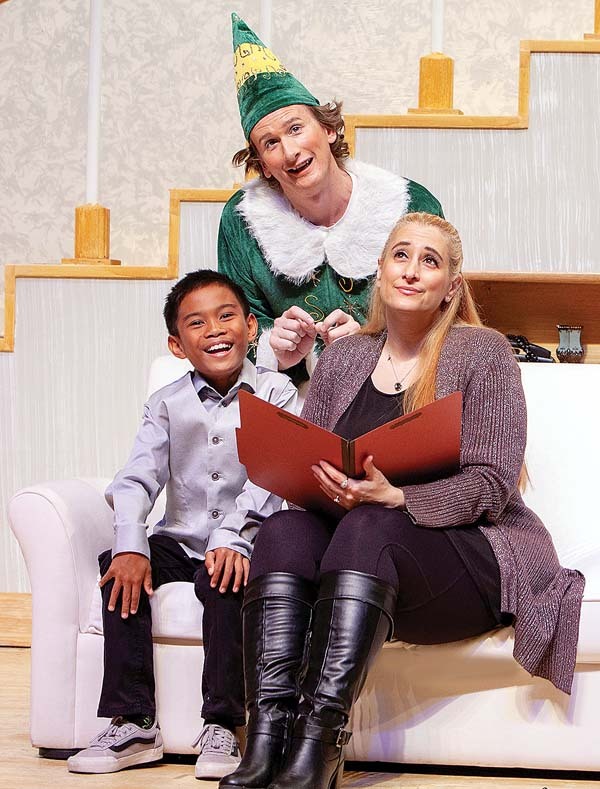 Billed as, “Back by overwhelming demand” by the public, combined with “Elf” being Maui OnStage’s biggest box-office hit, Ricky Jones returns as Buddy the Elf to the Historic Iao Theater in Wailuku to kick off the holidays. “Elf The Musical” is currently on tour with stops in Dallas, Detroit, New Orleans and Pittsburgh, but because national “Elf” tours have never visited Hawaii, Maui OnStage has had the good fortune of being the only theater company in the world granted the rights to produce “Elf” three times. 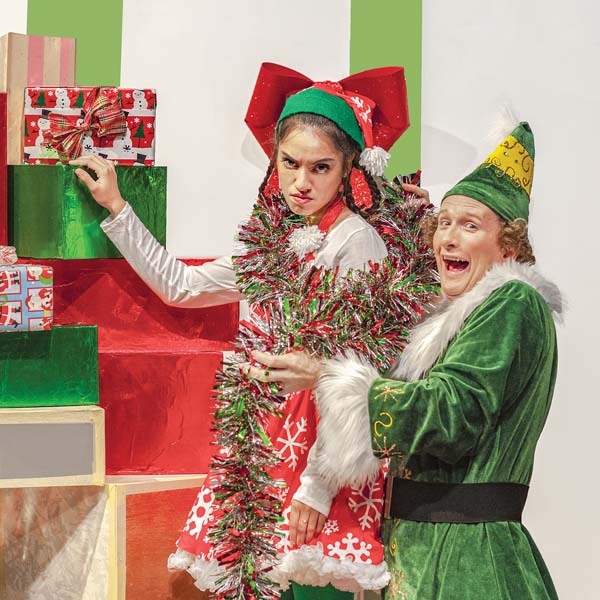 In 2014 and 2015, I called “Elf” “a truly great Christmas show” and “a smiler from start to finish.” There are a multitude of reasons to be grinchy around the holidays, but if “Elf” can’t cure those blues, perhaps nothing can. Walter Hobbs (Bennett Cale), Buddy’s biological father, doesn’t believe in the spirit of Christmas, nor do most New Yorkers in “Elf.” When Santa’s sled, powered by Christmas cheer, crash lands in Central Park on Christmas Eve, Buddy is determined to lift New York City (and Maui’s live audience) into the Christmas spirit. “Remember the ornaments you made way back in second grade . . . remember who you were back then, let those moments live again . . . just sing a Christmas song,” croons Buddy. I asked Jones why he chose to play Buddy a third time. 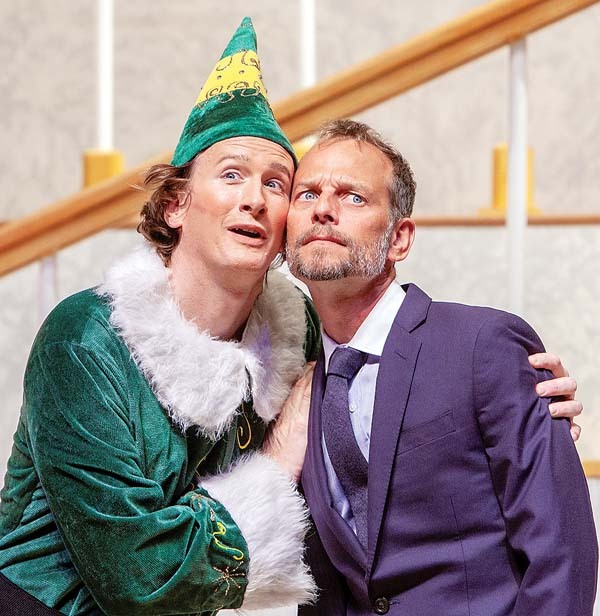 Director Dale Button, who previously played Walter in the past two “Elf” productions, explained the difference between directing this time around and acting in it. “I said ‘Yes’ immediately (to directing), and then thought ‘Wait, let me think about this.’ It’s a lot easier being in a show than being in charge of it,” he admitted. “A cast of 33 is a huge responsibility, especially since eight cast members are age 13 and under — but it has been fun holding the reins. 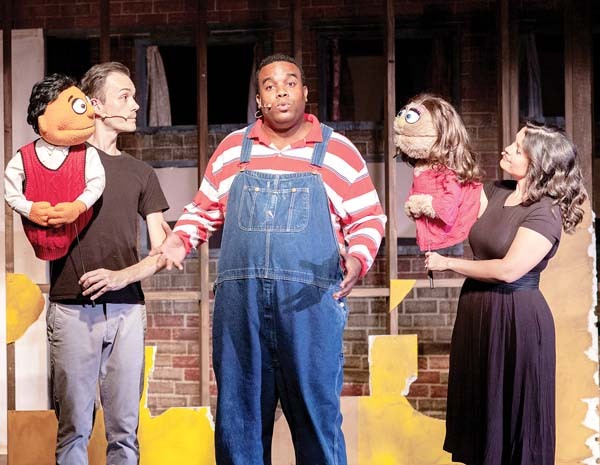 “The musical is the same, but this production is completely different. There are a few aspects that weren’t there before, and a few surprises that I don’t want to give away. The new cast brings those aspects and, because of that, it will be a fresh look at ‘Elf,’ “ Button continued. “Elf” 2018 has an almost entirely new cast, a new set and a new choreographer in Kalani Whitford. “It’s the epitome of the Christmas spirit, and there is nowhere better to get that holiday feeling on Maui. I finally have the time to do a Maui OnStage musical, and fully immerse myself in the experience. When I heard that Jovie was available, I thought, ‘I’d love to step into those ‘Elf’ shoes,’ “ Leal revealed. “I took my little sister to see it in 2014, and then we went back again the next year. She had her elf hat and her snowflake wand. When it started snowing, she leaned over and said, ‘It’s snowing!’ It was the cutest and sweetest moment ever,” Leal added. A popular novelty from previous Maui productions are the light-up elf hats that audience members don to aid Santa’s plight. This year, in addition to the hats, light- up Santa wands will be available for purchase. Family also influenced Watt to join the cast — as Santa Claus no less. 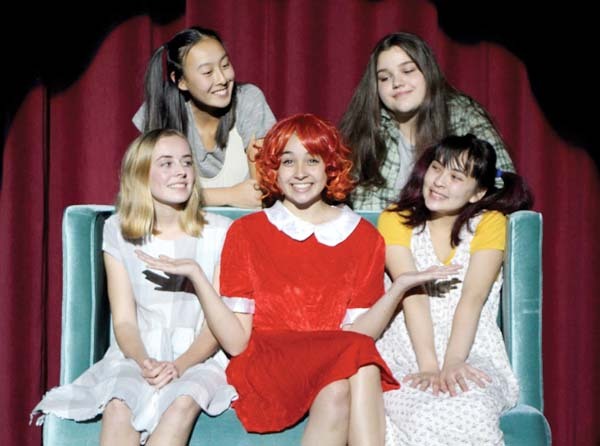 The frequent Maui OnStage performer shared, “I wanted to introduce my little girl (AggieMaggie Watt) to the joy of theater, and share the experience of her first play with her on stage,” said Watt. I asked what his favorite part of being in “Elf” is. “Watching Ricky and interacting with Buddy on stage. Ricky’s energy is something else,” he replied. 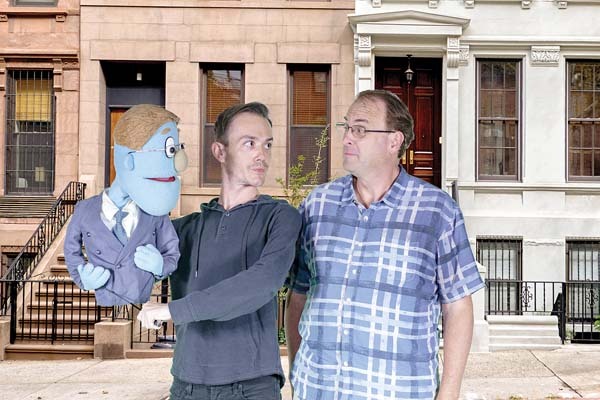 “Sharing this show with a mostly brand new cast, and seeing them discover the joy of bringing it to life has been wonderful. But I’m most looking forward to watching the faces of the audience again,” says Jones. I asked Jones why Maui likes Buddy and “Elf” so much. 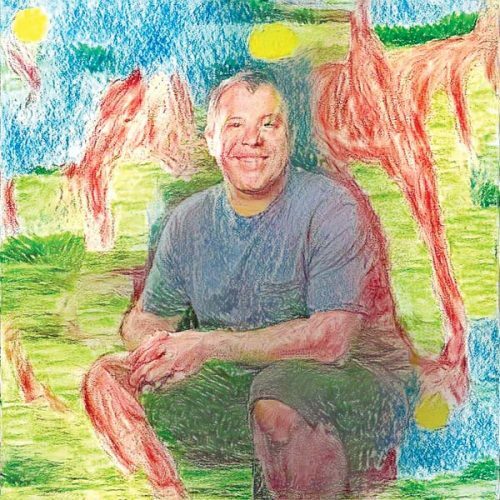 “People stop me in the grocery store or at restaurants to tell us how the show affected them — how the holidays are a hard time for them, and how much the show helped them to just relax and smile for hours,” explained Jones. “You leave the theater a little lighter. And especially in our small island community, it gives you the perfect boost you need to treat everyone you meet a little better all season long. I asked Watt why Maui audiences should see “Elf” again. “Because of the sheer joy of having a smile put on your face. There are not a lot of things in this world that give you that pure sense of joy, but ‘Elf’ fits that bill,” he said. • Performances are at 7 p.m. Nov. 30 and Dec. 1 at The Ritz-Carlton, Kapalua. General admission tickets are $10 and are available in person through the Maui Preparatory Academy office, at Lahaina Music and at the door. For more information, contact Vania Jerome at vjerome@mauiprep.org or call 665-9966. 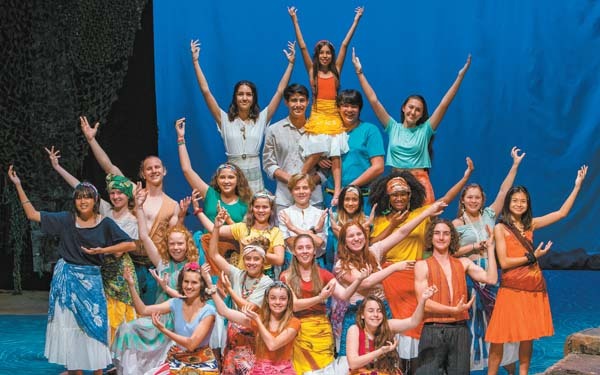 ProArts Youth Theater opens “Disney’s Aladdin Jr.,” directed by Francis Tau’a and Kirsten Otterson, based on the 1992 film and the 2014 hit Broadway production. • Performances are at 7 p.m. Fridays and Saturdays and 2 p.m. Sunday, Dec. 2, opening Nov. 30 through Dec. 8 at the ProArts Playhouse in Azeka Place Makai in Kihei. Tickets are $15 for adults and $8 for students 16 and younger. For more information or to purchase tickets for any ProArts event, call 463-6550 or visit www.proartsmaui.com. 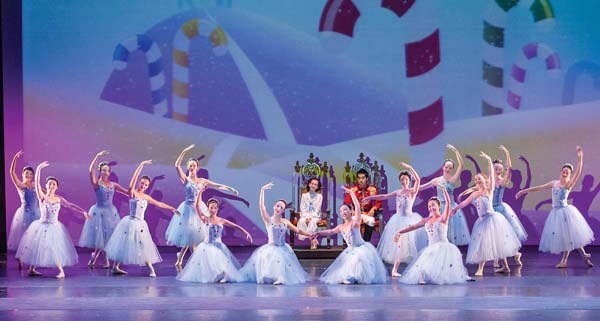 The Maui Academy of Performing Arts presents “Nutcracker Sweets.” This abbreviated adaptation of the treasured holiday classic features 120 MAPA student dancers, stunning costumes and beautiful choreography set to Tchaikovsky’s timeless music. 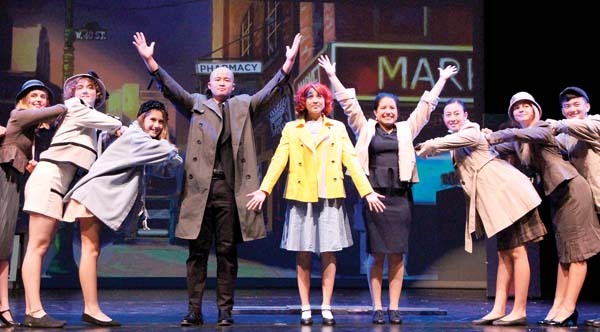 • Performances are at 7 p.m. Saturday, Dec. 8 and 3 p.m. Sunday, Dec. 9 in Castle Theater at the Maui Arts & Cultural Center in Kahului. Tickets range from $18 to $30 (plus applicable fees) with discounted tickets available for kids 12 and younger. To purchase tickets for any MACC event, visit the box office, call 242-7469 or order online at www.mauiarts.org.